As is often the case with rumors, confirmation one way is generally just over the horizon. Take yesterday's rumor that Sega was taking High Voltage Software's The Conduit for the Nintendo Wii under it's loving, publishing wing. Today Sega has issued an official press release announcing themselves as the game's publisher for North America and Europe, and Sega of America President Simon Jeffery tells us why. I'd have to agree wholeheartedly. The Conduit is the most exciting thing the Wii has going for it right now. Nice catch, Sega! Hit the jump for the full press release, along with some juice new screens of The Conduit in action. SEGA Gets Zapped by High Voltage with The Conduit SEGA to Publish Highly Anticipated Wii Title in Spring 2009 SAN FRANCISCO & LONDON—(BUSINESS WIRE)—SEGA® of America, Inc. and SEGA® of Europe Ltd. today announced a worldwide partnership with High Voltage Software to publish and distribute the Wii™ home video game system-exclusive title, The Conduit. The first-person shooter garnered multiple awards at E3 2008, including Best Wii Game by GameTrailers and three awards from IGN: Best Shooting Game (Wii), Best Graphics Technology (Wii) and Best Overall Wii Game. 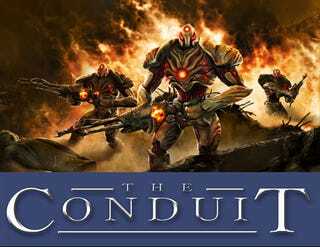 The Conduit is a stunning, futuristic title powered by a new game engine technology that delivers remarkable visuals and effects, as well as a rich interactive experience that is unlike any other title on the Wii. “The Conduit is one of the most talked-about Wii games this year and High Voltage Software has only scratched the surface of the game in terms of what they have shown so far,” says Simon Jeffery, President of SEGA of America, Inc. “They have proven that graphical and technological innovation can be exciting to the Wii market, and SEGA is thrilled to partner with a team that truly shares our belief in the Wii’s gaming potential beyond the casual market.” “High Voltage Software's partnership with SEGA to publish The Conduit represents an important milestone for this studio,” said Kerry Ganofsky, CEO and founder of High Voltage Software, Inc. “SEGA shares our vision for the title and its tremendous potential, which is why we chose them from a long list of potential partners. With their support, we are confident that The Conduit will deliver the definitive shooter experience that Wii fans have been waiting for.” The Conduit takes players into a dark story in Washington D.C. after a vicious alien invasion has rocked the country. An organization called the Trust has sent in Secret Service agent, Mr. Ford, to go up against the insect-like alien race known as “The Drudge.” Armed with an array of futuristic weaponry and an intelligence-gathering device simply called the “All-Seeing Eye,” players follow an intricate storyline filled with conspiracy, shady government activity and terrifying aliens. The Conduit’s detailed control system allows players to customize and configure look sensitivity, turning speed, the dead zone and much more. As players delve further into the mystery behind the extraterrestrial invasion, shocking details reveal that the invasion may have been brought on with help from the government itself. Powered by High Voltage Software’s groundbreaking Quantum 3 engine, The Conduit ensures that players will experience single and multiplayer gameplay with graphical fidelity never seen before on the Wii. The Conduit will also support the recently announced Wii Speak peripheral, allowing online multiplayer gamers the ability to chat as they destroy aliens in each terrifying level. Additionally, the game will take advantage of the Wii MotionPlus for optimal control.